Ludlow Junior SCHOOL — STEAM Co. Rocket Boys and girls. Electric cars. Robot lawn mowers. Poetry. How a few Shropshire Lads help power a STEAM Co. Day to connect the community of a country school near the birthplace of the steam powered industrial revolution. Full write up and film of this special day. On a recent end of summer term visit to his home town of Ludlow in Shropshire, STEAM Co. co-founder Nick Corston popped in for a chat at his old Junior School to find they had plans for a STEM day. After Nick had told the head teacher, Mrs Sally Swann about how and why STEAM Co. spell STEM with an 'A' ; to bring creativity into the mix, the school set about organising Shropshire's first STEAM Co. Day. And Nick reached out to a few Shropshire Lads for help, hitched up the STEAM Co. Pop-Up Day Drop Truck and headed home. All just a few miles down from the Ironbridge Gorge and Colebrookdale, home of the industrial revolution, powered by steam, not STEAM. One reason to spell STEM with an 'A' is because #Artconnects - Art is what we call it when what we do connects people. STEAM Co. is all about making connections for the benefit of all our children, for all our futures. Earlier in the year Nick had been invited to an ARM Forum event at the Science museum, hosted by ARM, the British firm who design the computer chips in most smartphones and tablets. After a short chat and exchange of business cards with Lord Martin Rees, the Astronomer Royal, who Nick had seen speak at a Nesta innovation event, he was surprised to see that Lord Rees was the Lord of Ludlow. Moreover Lord Rees explained how his parents had founded a progressive school which Nick knew well at Bedstone, in the countryside near Ludlow. Lord Rees was very interested in supporting STEAM Co.'s work, so who better to give a short introduction to the STEAM Co. Day at Ludlow Junior School, which he filmed at the Royal Society in London? In the extended clip here Lord Rees shares his thoughts on inspiring and engaging children in science as well as the importance of creativity and community. As Nick says in the film below, he's proud of his dad, not least for the work he's done in the local community as a councillor, establishing summer play schemes and local conservation projects. In his 80's now, Peter Corston still volunteers in the Oxfam bookshop in Ludlow where he came across a book which he said is the best book he's ever read (and he's read a few!). 'Rocket Boys' by Homer Hickam was No 1 in the New York Times best sellers list and made into a block buster movie 'October Sky' (anyone any good at anagrams?) and is a compelling story of aspiration, invention and family. It tells the story of how Homer and a group of friends in a dying mining town in West Virginia, USA, saw a Sputnik one October evening in the 50’s and were inspired to go on a journey to make their own rockets (the last going 6 miles high) and ultimately work for the NASA space programme. Earlier this summer Nick connected via Twitter with Homer Hickam in the USA. They collaborated on the production of the STEAM Co. 'Rocket Boys (and girls)' talk which Nick and the STEAM Co. team staged at Camp Bestival and are now taking to Primary and Secondary Schools across the UK as the STEAM Co. Sampler to show and tell them about STEAM Co. and #INSPIRANATION. So what better way to kick off the STEAM Co. Day at Ludlow Junior School than with Homer Hickam's 'Rocket Boys' story to inspire the children before letting them make and fire a few paper rockets before a firing of a real, 'black powder' 2 stage rocket with parachute recovery system in the closing assembly? As well as sharing Homer Hickam's inspiring story, Nick also told the children about someone else who, after lots and lots of reading, hard work and learning from his mistakes was now literally making the world a better place. They were literally open mouthed to hear of the achievements of Elon Musk and how he had used the proceeds of selling a company called PayPal that he had helped build. Nick told the children about the reusable rockets Musk was building at SpaceX as well as his Solar City project to harness the energy of the sun and Hyper Loop to literally fire people down tubes between cities. He also explained the three phase business strategy of Tesla's electric car which, culminating in the biggest product launch in history with $16bn of sales made in a few weeks, was a 'STEAM Powered lesson for all our futures' and inspired this STEAM Co. blog. How amazing then for the children (and Nick) to be able to borrow a Tesla Roadster electric sports car for the day from another Shropshire lad that Nick has connected with on his STEAM Co. journey. Not least, given its 0-60 in 2.8 seconds performance, Nick wasn't able to drive the Tesla in the playground with children around but did take along a GreenPower Trust Goblin electric car that a lucky pupil was able to drive at the end of the day in the closing assembly. This Goblin car was built on a STEAM Co. Day and loaned by St Saviour's Primary School in Paddington, London and has been raced at Goodwood as seen in this film. Local agricultural engineering firm McConnell helped out with a newspaper engineering activity and brought Robocut - an amazing caterpillar tracked robotic grass cutter along to show the children. The children used a STIXX machine to roll newspapers into rods with which they built structures. STEAM Co. have worked with Barclays Digital Eagles across the UK and were delighted that a member of their team was able to pop along to Ludlow Junior School. He ran an activity with a local dad to show the children how to code the BBC Micro:bit wearable computer, that was recently given to a million UK secondary children. Staff from the local Tesco Store ran an activity to tell the children about food, healthy diet and nutrition. As part of their national Eat Happy project, it is a great example of how STEAM Co. can collaborate with national initiatives like this to provide activities to include on STEAM Co. Days. Here's a short film we made of this extra special STEAM Co. Day. See the Robocut in action and rockets being made and fired. Hear from the teaching staff and what parents thought of the day. Thanks to everyone in the Ludlow Junior School community especially head teacher Mrs Swann and her creative, collaborative and hard working teaching and support team for all their help in making it possible. "It's important to teach the basics in schools but applying them is what prepares you for life. We need to get more excitement about learning into schools." 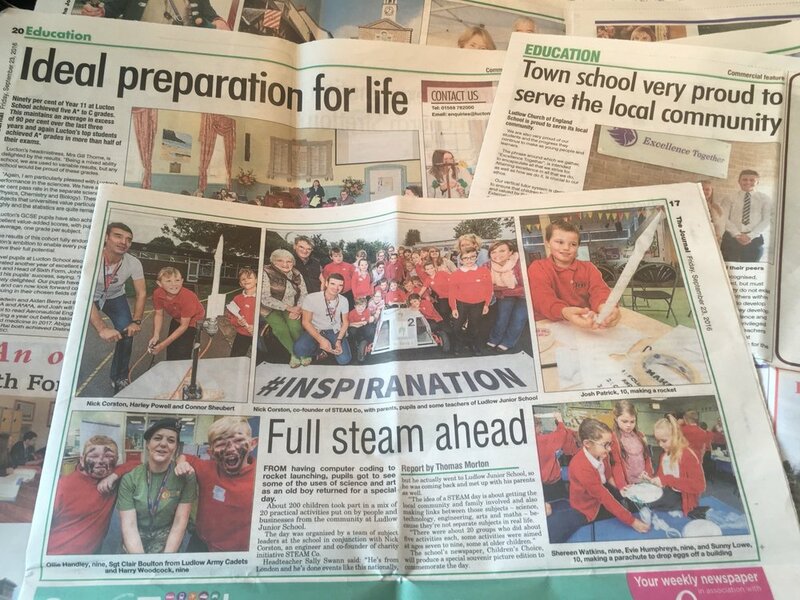 Once again this STEAM Co. event had fantastic coverage in the local newspaper, The Shropshire Journal, which interestingly featured it just before an education supplement with headlines like 'Town School, very proud to serve the local community', 'students of all abilities achieve well at community collage' and 'Ideal preparation for life'. No surprise then that STEAM Co. felt at home back in Shropshire. We'd love to hear what other schools in the area and beyond, thought of Ludlow Junior School's day in the comments below. Since writing this and on the back of it, Nick was invited to give a keynote speech to school leaders from across Shropshire at the TESS 2016 event held at Engenuity, in Coalbrookdale near Ironbridge, the home of the first steam revolution! He opened his talk with a standard 8 cine film clip of when he was one with his dad and his first ever trainset. Nick was delighted to share the stage with Nicola Grant, deputy head at Ludlow Junior School who shared anecdotes from the day and the impact it has had on the children and their learning since. A STEAM CO. DAY IN YOUR SCHOOL? Why not book a half day 'STEAM Co. Rocket Boys (and girls)' Sampler for your school and/or start thinking about running your own full blown STEAM CO. Day with your community. Click here to find out more about a Sampler session or a Pop-Up STEAM Co. Day.